Sacroiliitis is difficult to diagnose and harder still to quantify or monitor response. Dynamika is a stand-alone, cloud-based software using complex algorithms to allow real-time, user-defined analysis of regions of interest (ROI)in 3D and allows quantification of signal intensity (and/or contrast enhancement) within these ROIs on scans. The ROI evaluation technique in simplest guise was used to evaluate isotope imaging as proof of principle but we aim to show similar/better success with this software on STIR MR images. 50 MRI and 30 bone scans were analysed to evaluate initial validity of Dynamika software, including some follow-up imaging - giving insight into how disease monitoring could be undertaken. This analysis was benchmarked against scintigraphy standard peak-trough algorithm analysis. Potential to diagnose and grade disease and also monitor response with MRI, as well as show its superiority compared with bone scanning - though show utility of the software with bone scans also. 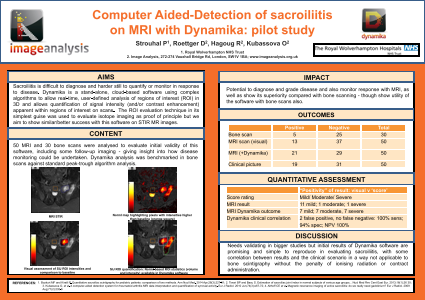 Patients can be quantitatively graded into mild, moderate or severe sacroiliitis with greatest reliability using MRI +Dynamika.